Don't worry, the chips on the pills are much smaller than this one. Have you ever forgotten to take you medication? Well you might never have to remind yourself again now that there’s a new ingestible microchip by Proteus Digital Health that monitors your health from the inside. The FDA has approved a new smart pill equipped with a tiny microchip that keeps track of your insides and relays that medical information back to your healthcare provider. The microchip itself is a silicon wafer that contains trace amounts of magnesium and copper and is no bigger than a grain of sand. After its been ingested, the chip is able to generate electricity once its made contact with the stomach’s digestive fluids. 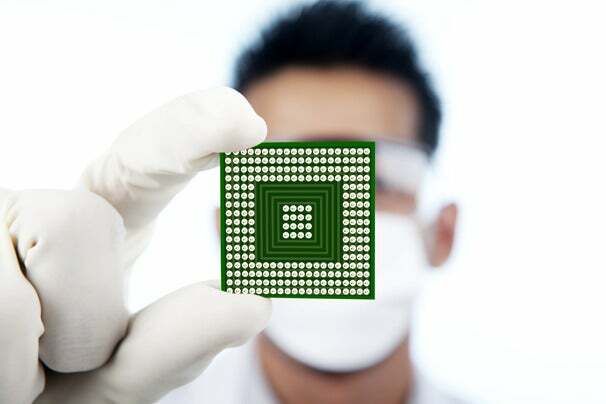 Once the chip is activated, it sends a signal to a patch on the patient’s skin, which in turn relays medical information to the healthcare provider’s mobile phone. The ingestible sensor can send information about the patient’s heart rate, body position, and activity to a doctor or nurse. Currently the FDA have only approved the device to be used with placebo pills to test the system’s safety and if it actually works. Proteus hopes to begin implementing its ingestible chip with real medications in the near future. While a chip that reminds you to take your medicine might sound excessively unnecessary, patients with chronic diseases or ones that need to take multiple medications at different times of the day may find this technology extremely useful. In any case, Big Brother is watching. Watching your health.